The minimalist Now Playing window shows what’s currently playing, be it a video or artwork from your currently playing song. Onscreen controls let you adjust the volume, skip between listed songs or videos, or pause the action. Windows Media Player offers the same basic controls when playing any type of file, be it a song, video, CD, or photo slide show. 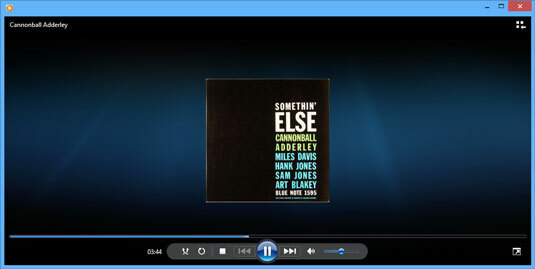 The figure shows Windows Media Player open to its Now Playing window as it plays an album. The labels in the figure explain each button’s function. Or rest your mouse pointer over an especially mysterious button, and Windows Media Player displays a pop-up explanation. Show List: Shows the playlist along the right side, which is handy for jumping directly to different songs. *Full Screen: Enlarges the window to fill the screen. Repeat: Loops the same song. Visualizations: Choose between showing the album cover, wavy lines, groovy spirals, dancing waves, or other freaky eye games. Enhancements: Opens an equalizer, balance adjuster, playback speed, volume balancer, and other sound options. Lyrics, Captions or Subtitles: Display these items, if they’re available, which come in handy when practicing for Karaoke night. Shop for More Music: Head to Microsoft’s website to buy songs or albums from online stores. Always Show Now Playing on Top: Keeps the window above your other windows on the desktop. More Options: Brings up the Options page, where you can tweak Windows Media Player’s habits when ripping CDs, stocking your Windows Media Player library, and other tasks. Help with Playback: Fetches the Help program to deal with head-scratchers. The Now Playing controls disappear from the screen when you haven’t moved the mouse for a while. To bring them back, move your mouse pointer over the Now Playing window. To return to the Windows Media Player library, click the Library/Player toggle icon in the window’s top-right corner. When you minimize Windows Media Player to the desktop’s taskbar, hover your mouse pointer over the player’s icon: a control pops up, letting you pause or jump between songs.